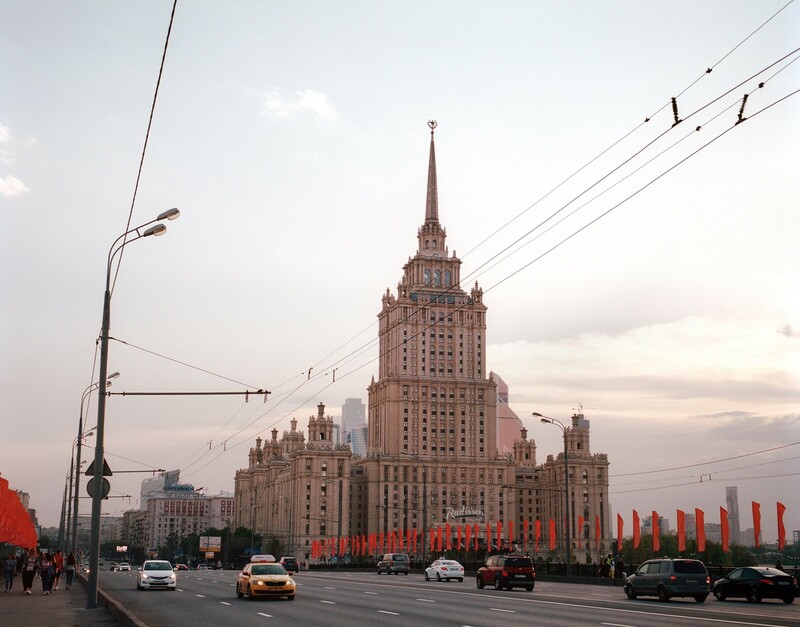 For the location of his AW18 show, and the final part of his Russian trilogy, Gosha Rubchinskiy chose Yekaterinburg’s Yeltsin Center museum, which documents the mandate of the first president of the Russian Federation from 1991 to 1999. Here, the designer’s post-Soviet youth walked through the museum’s rooms as if walking through history, invading the different spaces before arriving at a stage strewn with musical instruments, letting rip to reclaim all the symbolism of this pivotal period in the country’s past. In finale, they sang an unaccompanied rendition of Nautilus Pompilius’s “Goodbye America”, a song from the prohibited Soviet underground music scene of the late 1980s – a rare space where Russians could feel part of the rest of the world. Rubchinskiy’s fashion viewpoint rests on the magnetism of ‘forbidden’ clothes from an outside world, a vocabulary the new generation has now made global. Even by his own panoramic standards, this was an exercise in soaring creativity from Rubchinskiy, a performance bidding farewell to the nostalgic 90s themes so cardinal to the designer’s previous collections. 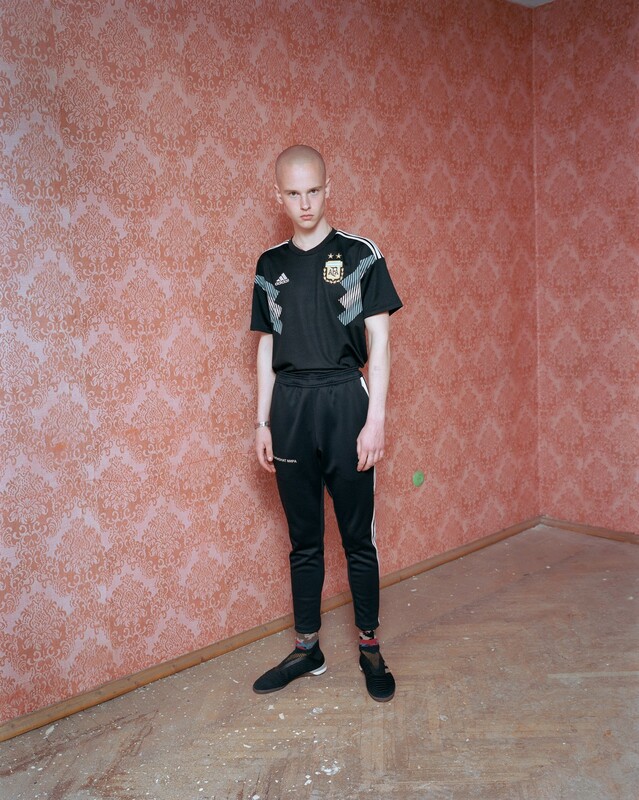 As Russia prepares to host the 2018 Fifa World Cup, Rubchinskiy has been working on his own terrace story, collaborating with adidas Football over the past three seasons. Technically authentic pieces result, and as this summer’s action kicks off, their union is set to reveal more, right down to a Gosha Rubchinskiy football and a special adidas Predator boot, the first real football shoe (with studs) in his collections. Or perhaps in any designer’s. Eleven jerseys have been realised, relating to the 11 Russian cities hosting World Cup games. Their player number reflects the place’s geographical position, south to north as a figurative football field – Sochi, the southernmost point, has a goalkeeper’s colour and number. Inspired by vintage uniforms, details include printed velour and Russian flag trim. They’re now at Dover Street Market, Comme des Garçons stores and selected adidas locations. On Rubchinskiy’s moodboard? David Beckham in the 90s. For the curtains. 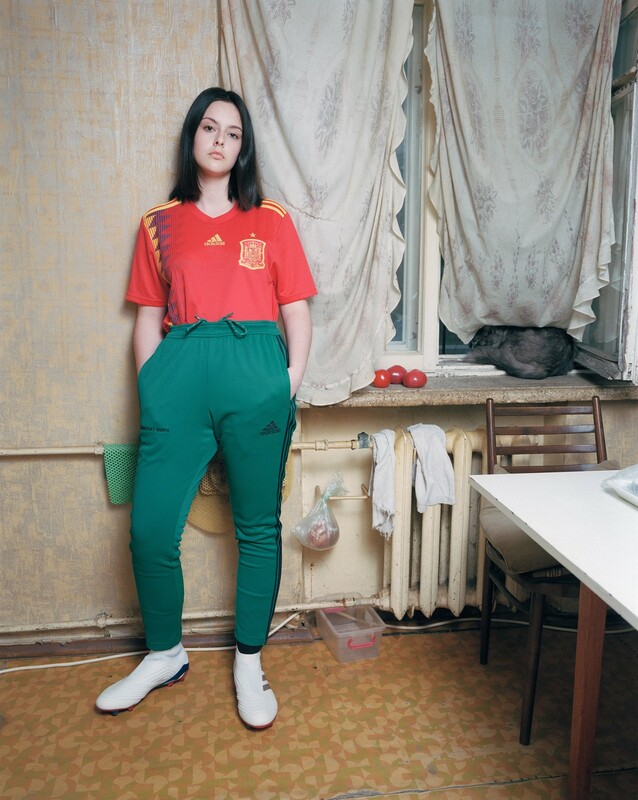 Later this year, Rubchinskiy will also unveil a photobook documenting the World Cup as he sees it, a meditation on Russian life through the medium of sport. Such is the creative’s impact over the past decade – his first show was in Moscow, 2008, years before partnering with Comme des Garçons – that if this feature read ГОША РУБЧИНСКИЙ throughout, you’d still know who we were talking about. Adding skate label PACCBET (pronounced ‘rassviet’) to his portfolio in 2016, there’s no playing down his achievements: Rubchinskiy has us all speaking Russian. What did adidas mean to you growing up? Gosha Rubchinskiy: When we started our brand 10 years ago it was a dream for me to work with adidas – it’s the most popular sports brand in Russia and has been so since sponsoring the Soviet Olympics (in 1980). That’s why it’s the brand Russian people want to wear and it’s the same for me. In the late 80s when my parents went on their first trip outside Russia, they bought some cool adidas sneakers for me. Also when I was at school I used to wear adidas tracksuits. I remember being in the discotheque at summer camp when The Prodigy album The Fat of The Land was out – there were a few girls who would dance every night and they did the dance from the Firestarter video. One of the girls was wearing brand new adidas shoes and it was an iconic moment in my life. On the other hand what do you think your collaboration means to adidas – what can you offer them that’s new? Gosha Rubchinskiy: We waited for the right moment and the World Cup is right moment, adidas is one of the main sponsors of the event and equips the Russian team. It was thus natural to work with a Russian designer and I think they want to be present not only as a sponsor, but also in a cultural way. They also understand that all Gosha projects are not only about the collections, they always speak about Russian culture. Collaboration is a very important theme in your work. What do you love about it? Gosha Rubchinskiy: The main reason for every collaboration is to give something to each other. It’s the same with Burberry – it was our second season with adidas and the second season for our World Cup project, and we took our show to St Petersburg because it was the first city where football arrived in Russia in the 19th century, introduced by the British. Hence I wanted to collaborate with an iconic British brand. Burberry was the obvious choice because they have a strong past association with football fans and football culture. So it came together naturally. I wanted to build a nostalgia of 90s electronic music, rave and also football fans. And you’re shooting a book documenting the World Cup? Gosha Rubchinskiy: I’m working on it. For all the shows in Russia we already produced small books, like city guides. Sometimes about architecture, sometimes about music, sometimes about some culture and artists from the cities; Kaliningrad (AW17), St Petersburg (SS18) and Yekaterinburg (AW18). For the last part of the collaboration, I want to produce a proper photo book of the project – the idea is to go to each of the 11 Russian cities where games will be played and shoot Gosha’s vision of the World Cup. Something I find interesting to show. Gosha Rubchinskiy: Yes. I’m shooting now, and I’ll shoot during the games, like a reporter at the pitch. I was at the Russia-Argentina game in November. The book will be a mix of city images, football fans and some pictures during the games. It will be released later this year. In your AW18 show, there was an artwork by Erik Bulatov called Red Freedom. You’ve always seen skateboarding as an emblem of freedom but do you see football as an emblem of freedom too? Gosha Rubchinskiy: For me, sport, music and culture can unite people and make them feel free. There is a lot of political upheaval nowadays and I think we all need a big multicultural event like the football World Cup; it needs to be separate from politics. It’s a good opportunity to bring people from around the world to Russia and let them experience the country with their own eyes. What do you like about football kits? Gosha Rubchinskiy: I like the idea of uniforms and subcultures. Nowadays there aren’t as many subcultures as before, but I think football still has a subculture; football fans still have a distinct wardrobe so that's why it's interesting for me. Also, traditional football kit is interesting. This project helps me to understand more the way of working with uniforms and sportswear, it is a great learning experience working with adidas. That's why it was important for me to create not just a collection inspired by football, but to do a proper football shoe and the ball and jersey. 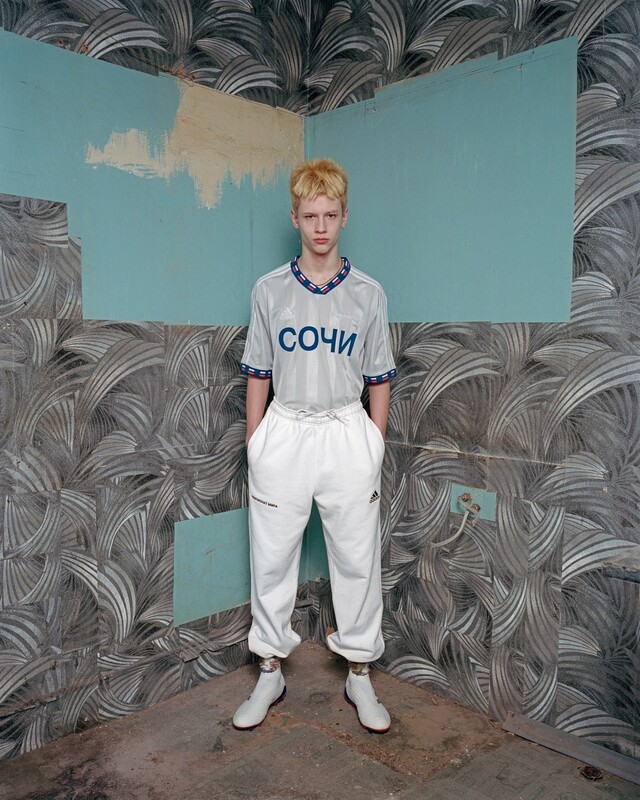 We will launch this special Gosha Rubchinskiy football kit during the World Cup. Talking about the culture of ‘the drop’, there is a lot of anticipation when your own collection arrives at Dover Street Market. It’s almost mania. Do you embrace that level of devotion? Gosha Rubchinskiy: I like the idea of accessibility, when people can get what they want. I don't necessarily like when people need to be in line and fight for the product. I want people to be free to buy what they want. For me, I don't want to be part of hype, I don't like this idea and I want something different for myself and for my brand. Of course, it’s cool when kids like it, when it sells well and to sit next to all these brands – it means we are a part of something. My idea was to tell the stories about youth today, and considering where we stand now, it means we’ve done something right. But for me, I want to do something else every time, something different. That’s why we want to try something else. You talked on Instagram about a new future for your brand. Can you tell us about that or is it still secret? Gosha Rubchinskiy: We just want to change strategy, the brand is 10 years old this year, we had our first show in Russia in 2008. After that show, a journalist came to me and said: ‘Gosha, what are your thoughts on the future of fashion?’ And I said: ‘What I showed today is how I see the next 10 years in fashion.’ Now, after 10 years, we build again. I want the collection to come from the project. The main focus will be art and the collection will be part of the art. From the beginning your collections have always been fairly priced. Was that always important to you? Gosha Rubchinskiy: Yes, but it also depends on the product of course. I think it’s crazy to sell t-shirts and sweatshirts for hundreds of euros. But if it is some special product, like a collectible or there’s a handmade element of course it can be expensive. That’s why we always have different kinds of products in our collection – we keep t-shirts and sweatshirts that schoolkids or students can buy if they want to have Gosha. They can be a part of it. We’ll keep doing this, but at the same time I also want to do some interesting pieces in future projects, more collectible with more special items. Do you feel famous? You are an idol to teenagers. Gosha Rubchinskiy: I feel famous not myself but… The brand. You've done a lot for Cyrillic script, there's so many brands printing clothes with Russian words now and they're not even Russian. Gosha Rubchinskiy: Yes, it’s funny. It’s like what I said, we did a 10-year project and now it’s time to do something new. I want to separate Gosha Rubchinskiy from the Gosha Rubchinskiy brand. What we’ve built is world famous now, but I feel a little bit uncomfortable about my name as a brand, and want to separate myself from the image we built. You barely use Instagram. Does keeping a distance help you focus? Gosha Rubchinskiy: I use Instagram as an online gallery, like if I want to put out some message or image. I use it to share a mood I have at the time and I think it is good. I don’t want to keep it as a diary and a lot of memories. Personally, I don’t like to look back, I like to refresh every time. Do you feel part of the fashion system? Gosha Rubchinskiy: I started to feel part of the system and that's why I wanted to change. I would like to do it my way. Your casting has always been very strong and you give a platform to many teenagers. Does their success make you proud? Gosha Rubchinskiy: Yeah, it’s happened many times. We started to scout people in Russia for my shows and for my projects and now we have a few model agencies in Moscow and St Petersburg, also in Ukraine, Kiev we have young model agents scouting interesting Slavic faces. Now I can see a lot of people from ex USSR countries walking in prominent shows like Rick Owens during Paris and London fashion weeks. I think we built a strong image for Eastern European characters, it’s been my mission to do it. Do you like seeing your clothes worn in the street? Gosha Rubchinskiy: Of course. If you do a product it needs to be worn. Yesterday, I came from the airport in a taxi and getting out of the car, I saw a boy in the street wearing one of my t-shirts. I thought: ‘Wow’. When you’re based in Moscow, travel to Paris and one of the first people you see is wearing your stuff, that’s good. Maybe one day your work be in the Hermitage. What would you like to see there? Gosha Rubchinskiy: Oh I don’t know (laughs). That’s not for me to decide, it’s up to other people. But I would like to see young people in the Hermitage and if they came for that reason I’d want to be in there. What about in Russia? Do you think people wear – or see – your work differently to us in London, Paris or New York? Gosha Rubchinskiy: I think it was different, but now it’s changed. When we started, sometimes people didn't understand what we were doing, but now with a new generation I think it’s the same everywhere, kids buying the same stuff and wearing it the same way. I don’t think it’s different in Russia any more than anywhere else. Can you tell us the similarities and differences between the Gosha Rubchinskiy brand and PACCBET? Gosha Rubchinskiy: With both brands we want to continue to show Russian culture to the world and with PACCBET we want to show Russian skateboard culture more specifically. The Gosha Rubchinskiy brand is more about myself and PACCBET is more about teamwork. Models from my first show grew up and now we work together on PACCBET. Tolia Titaev is one of the main guys and he was like 14 years old when he was in the first Gosha show 10 years ago. I just made it for them, the people who are around me all the time and they need to have their own project. With PACCBET it's interesting sharing ideas and being part of a team. You still design in Moscow? Gosha Rubchinskiy: Yes. The whole creative team is there, Paris is for production and wholesale. We’re working on a skate shop that’ll open in Moscow in late May because we still don't have an iconic skate shop like you find when you come to London, Berlin or Paris. So we decided to do it ourselves (laughs). It’s called October, after the famous skate spot in Moscow. We already know each other, but now we want to know what else is going on in Moscow and we want to meet new kids. And create a social hub? Gosha Rubchinskiy: Yes. Having places where you can find people with the same interests as you is important and this is our mission. We want to build this shop for that reason. What about the relationship between your photography and your collection? Gosha Rubchinskiy: I want to show ideas or a message through different medias. If I can’t show it in full with my collection, I’ll do it with photography and books. This year I’m working on two books; the World Cup project I mentioned earlier on, and a second book about my collaboration with Russian actress and director Renata Litvinova, which is more arty. It’s very different from my collection, my clothing. It’s interesting to work in photography and in future we’ll work in other areas too. But let’s speak later!